Kirill Petrenko is due to succeed Simon Rattle as the principal conductor of the Berlin Philharmonic Orchestra, and these recordings demonstrate the interpretive brilliance of this previously relatively unknown musician. 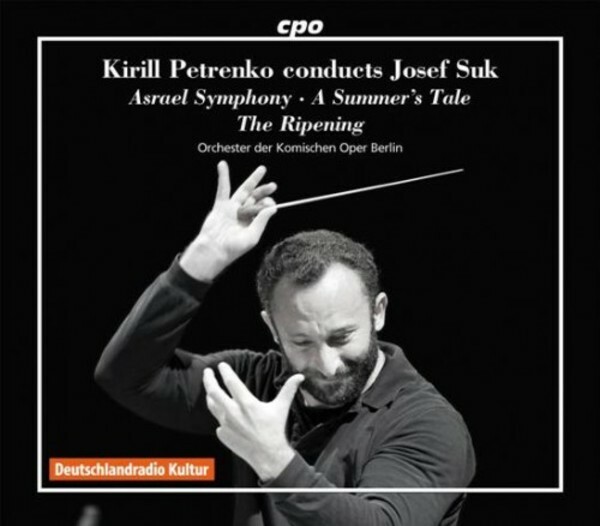 While Petrenko was serving as the general music director at the Berlin Comic Opera, he conducted symphonic works by Josef Suk for cpo that we are now offering to you in a 3 CD box at a special low price. Petrenko has a particular interest in Josef Suk and offers a breath-taking interpretation of the great Asreal symphony, Suk�s symphonic poem A Summer�s Tale and, finally, A Winter's Tale overture, after Shakespeare�s drama 'A Winter�s Tale'. The Orchestra of the Berlin Comic Opera demonstrates that it "is absolutely equal to the high demands of the scores, and Petrenko�s interpretive approach illuminates Suk�s complex tone world and shows it in a suspenseful and richly pictorial light" (klassik-heute.com). When it was announced in June that Simon Rattle's replacement as the next chief conductor of the Berlin Philharmonic Orchestra would be the Russian-Austrian maestro Kirill Petrenko, it caused much bemusement in the English-speaking press. Although well known to German audiences through his work at Berlin's Komische Oper and the Bavarian State Opera in Munich, Petrenko was a largely unknown quantity to the wider musical public. One reason is that, to date, he has made no more than a handful of commercial recordings: Pfitzner's Palestrina, a Rachmaninov Concerto, and a trio of Suk discs performed live by the Orchestra of the Komische Oper. The performances themselves feature some of the most compelling Suk playing on disc. The most familiar work to most listeners will be Asrael, composed in 1905�06 as a musical memorial first to Suk's father-in-law and musical mentor Dvoř�k, and then to Suk's young wife Otilka, who died of a heart ailment on 7 July 1905, just 14 months after her father. This is highly charged music, intense in expression and late-Romantic in its harmonic and tonal palette. Petrenko's performance is one of the most gripping available, infused with an urgent sense of momentum but also a miraculous delineation of the varied sonorities. The scherzo-like third movement has a mercurial feel to it, but opens up radiantly in the central trio section. The fifth movement is particularly powerful, the emotional and musical culmination of the entire work, its purifying C major conclusion especially affecting. In the 'musical poem' A Summer's Tale (1907�09), Suk examines the relationships of Day and Night, and more broadly of Man with Nature. This is another extraordinarily convincing performance, combining power and sensitivity in the big outer movements, and full of character in the middle three (not least the grotesque, scherzo-like fourth). Finally comes Ripening, a large-scale (in every sense) symphonic poem whose music goes further than the late-Romanticism of the preceding works to a more noticeably modern soundworld. The works Czech title, Zr�n�, means both ripening (as of fruit) and maturity, and Suk's music hints at a process of personal maturation that is achieved through bitter experience before reaching the calmness of redemption. Once again there is a discernible symphonic structure, with two scherzo-like sections framing a central Adagio (track 3), and once again Petrenko and his Berlin musicians rise brilliantly to the music's technical and expressive challenges. Suk's Tale of a Winter's Evening overture (an early work from 1894, with more than a whiff of Dvoř�k about it) and Liadov's Enchanted Lake form a pair of most attractive fillers, and these live recordings, made between 2002 and 2006, are splendidly captured by DeutschlandRadio. Both as a collection of Suk's most powerful music and as a taster of what is to come for the Berlin Philharmonic, they are wonderfully ear-opening.